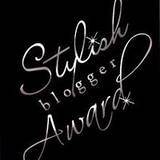 Bit of Blue Sky: My First Blog Award! Thank and link back to the person who awarded you this award. Done & Done! I love dark chocolate! My favorite is the dark chocolate Toblerone bars. I am a bit obsessive about cleaning my house. I vacuum the living room carpet 3-4 times a week. I like to dress up to run errands. For some reason I feel better about myself when I am dressed in something other than a T-shirt and jeans. Right now I am obsessed with wearing tights & ankle boots with my skirts & dresses. I guess it is my feeble attempt at being trendy. For Christmas I gave everyone moisturizing socks from Bath&Body Works. My mom gave me 2 pair and I wear them all the time. My feet are so soft! I have a fear of clowns and balloons. Yup, I am afraid of popping balloons. Little Miss and I share the same middle name. I was named for my Irish heritage and I wanted to pass the name down to her. Patty at I mean really...REALLY? ?